[S2564] Find A Grave: Shoshone Cemetery, shoshone, Idaho, Glenn L Sorensen, created by Allen Sorensen, added Mar 2008, memorial number 25168165. 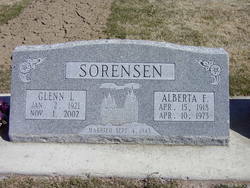 [S2564] Find A Grave: Shoshone Cemetery, shoshone, Idaho, Alberta Farrimond Sorensen, created by Allen Sorensen, added Mar 2008, memorial number 25168169. 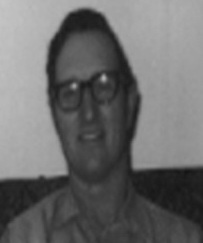 [S2385] Ken, family web site titled "Scudder Family Tree", KFTO (Ken's Family Tree Organizer), http://www.wuelzer.com/familytree/scudder/StartPage.html, updated Jun 2011, viewed Sep 2011. [S1437] National Cemetery Administration, U. S. Veterans Gravesites, ca 1775-2006, Digitized by Ancestry.com Operations, 2006. (Original publication: www. ancestry.com National Gravesite Locator, Ancestry.com, Provo, Utah) , date=2 Nov.
Wayne "Bud" Dimick Sorensen, 85, of Shoshone passed away at his home on Sunday, July 20, 2008. Wayne was born on Feb. 6, 1923, in Montpelier, Idaho to Leo T. and Lillian Dimick Sorensen. He was the second child in a family of nine. 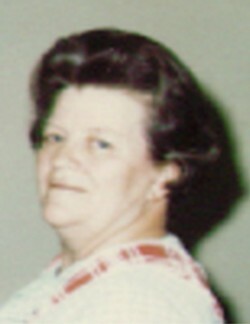 Wayne married Nina Ferguson on May 22, 1943 in Richfield, Idaho. They worked side-by-side on a farm north of Shoshone for over 30 years, with many fishing trips to Magic Reservoir thrown in after the chores were done. Bud loved his farm, cattle, horses, camping, hunting, fishing, playing cards, his family and friends and dancing. Wayne is survived by his children Karen (Roger) Law of Mountain home Idaho; Galen (Judy) Sorensen of Blue Eye, Missouri; Milton (Louisa) Sorensen of Gooding, Idaho; and Deann (Richard) Webb of Boise, Idaho, 12 grandchildren, 21 great-grandchildren; one brother, Gordon Sorensen, and one sister, Alice Webb, both of Shoshone, Idaho, and a dear friend and companion, Ann Gregory. 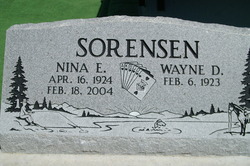 Wayne was preceded in death by his daughter, Susan, in 1961, his loving wife of nearly 60 years, Nina; his parents Leo and Lillian, siblings Glen Sorensen, Vernon Sorensen, Shirley Larsen, Sherman Sorensen, Eileen Morris, Christine Alger. Bud's family would like to thank the nurses from Idaho Health and Hospice, Mel, Gail, Pam and Jennifer, for their kindness, support and encouragement for the last two months, and his many dear friends that called and stopped by. Funeral services will be held at 2 o'clock p.m. on Saturday, July 26, 2008 at The Church of Jesus Christ of Latter-Day Saints in Shoshone. Interment will follow at the Shoshone Cemetery. A viewing will be held for family and friends Friday, July 25, 2008 from 4 to 7 o'clock p.m. at Demarary's Shoshone Chapel. Arrangement is under the direction of Demaray's Funeral Service. [S2564] Find A Grave: Shoshone Cemetery, shoshone, Idaho, Wayne Dimick Sorensen, created by Allen Sorensen, added Jul 2008, memorial number 28554452. 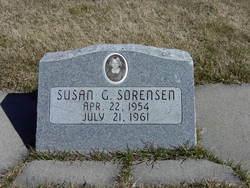 [S2564] Find A Grave: Shoshone Cemetery, shoshone, Idaho, Susan Gay Sorensen, created by Allen Sorensen, added Jul 2008, memorial number 28298066. 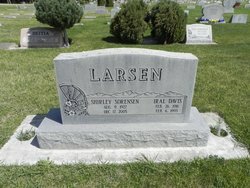 [S2564] Find A Grave: Shoshone Cemetery, shoshone, Idaho, Shirley Sorensen Larsen, created by Allen Sorensen, added Jan 2009, memorial number 32782694. [S2564] Find A Grave: Shoshone Cemetery, shoshone, Idaho, Iral Davis Larsen, created by Allen Sorensen, added Jan 2009, memorial number 32782619. 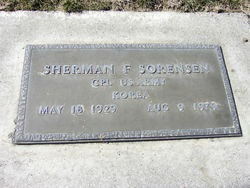 [S2564] Find A Grave: Shoshone Cemetery, shoshone, Idaho, Sherman F Sorensen, created by Allen Sorensen, added Jul 2008, memorial number 28298983. [S1469] Veromi, a current name and address on-line database, www.veromi.net, viewed Sep 2011. [S4523] Allen Sorensen, e-mail message to Linda Sargent Reinfeld, received 22 Apr 2013. [S2550] Classmates - Find School Friends, a web site for finding old high school friends and browsing yearbooks, http://www.classmates.com/?miscj=CMHeader, viewed Sep 2011. [S2564] Find A Grave: Shoshone Cemetery, shoshone, Idaho, Nina Elaine Ferguson Sorensen, created by Allen Sorensen, added Jul 2008, memorial number 28554424.